Chinook salmon populations have been in decline for years as a result of a number of factors including habitat destruction, harvest, and the effects of climate change. Of the thirteen wild Fraser River Chinook salmon populations assessed, only one is not at risk. The science is clear. The loss of these Chinook populations would be disastrous not just for wildlife that depend on them as a food source, but also for the many BC communities whose jobs and ways of life depend on Chinook salmon. That’s why the Government of Canada has taken, and is taking, urgent and concrete actions to ensure that at-risk Chinook salmon are protected for future generations. Establishing a process to have these important discussions will play a vital role in determining how best to steward this resource going forward and what options may exist to further address the social, cultural and economic importance of these Chinook stocks. Fisheries management measures for 2019 will support the recovery of at risk Fraser River Chinook populations and protecting the jobs and communities that depend on Chinook survival. These measures were developed following consultation with Indigenous communities, recreational and commercial fishing organizations and environmental organizations. These measures are one component of a larger strategy intended to place at risk Pacific salmon populations on a path towards sustainability. Commercial fishing: Commercial troll fisheries for Chinook will be closed until August 20 in Northern BC, and August 1 on the West Coast of Vancouver Island to avoid impacting Fraser Chinook stocks and to support conservation priorities. Non-retention of Chinook in, Johnstone Strait and Northern Strait of Georgia until July 14; a daily limit of one (1) Chinook per person per day from July 15 until August 29, and two (2) per person per day from August 30 until December 31. 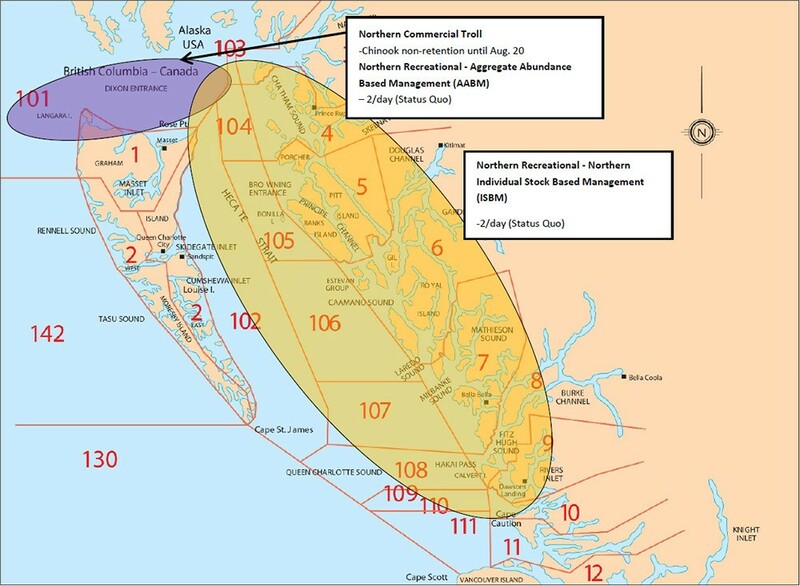 Non-retention of Chinook in the Strait Juan de Fuca and Southern Strait of Georgia until July 31; retention of one (1) Chinook per person per day as of August 1 until August 29, and two (2) per person per day from August 30 until December 31. Figure 1. Southern B.C. Management Areas and locations of Canadian fisheries that intercept Southern B.C. chinook stocks of concern. Primary fishing areas represented above in blue Fraser River Terminal fishery, yellow for the Juan de Fuca Recreational fishery and Southern Strait of Georgia, and red for the Johnstone Strait and Northern Strait of Georgia Recreational fisheries and green for the West Coast Vancouver Island (WCVI) Troll fishery and nearshore and offshore recreational fisheries. Numbers indicate Pacific Fishery Management Areas. These new measures are difficult, but they are necessary to address Fraser River Chinook decline. A continued decline would irrevocably harm species that depend on the survival of Chinook salmon, such as the Southern Resident killer whale. In addition, it would permanently affect the culture, heritage and livelihoods of Indigenous communities and permanently eliminate many jobs in the recreational and commercial fishing industries. Habitat protection – the proposed Fisheries Act, – if passed would restore lost protections to our waterways and specifically to fish habitat. Habitat restoration – we, in collaboration with the Government of BC, recently announced the establishment of the $142M British Columbia Salmon Restoration and Innovation Fund. As well, the Canada Nature Fund for Aquatic Species at Risk, provides $55 million fund over five years to support projects that help recover aquatic species at risk; the Fraser Watershed is one area identified for priority action. Science – the Government of Canada is making significant investments in science to enhance fish stock assessments and to adapt to the impacts of climate change. This includes an additional $107 million to support the implementation of the Fish Stocks provisions of the proposed Fisheries Act. These resources, committed in the Fall Economic Statement, will increase scientific capacity for stock assessment of Canada’s fish stocks, including Pacific salmon stock assessments. Predation – DFO, in partnership with research partners in Canada and the U.S., is convening a forum to discuss and assess scientific evidence relating to population dynamics of seals and sea lions, their diet and their impacts.The Government of Canada is taking significant action to ensure that our Chinook salmon survive for future generations. The measures announced today highlight the government’s commitment to working collaboratively to ensure the sustainability of Chinook stocks as a means by which to ensure the health of our ecosystems and the long term prosperity of Indigenous and coastal communities. Figure 2. Northern B.C. 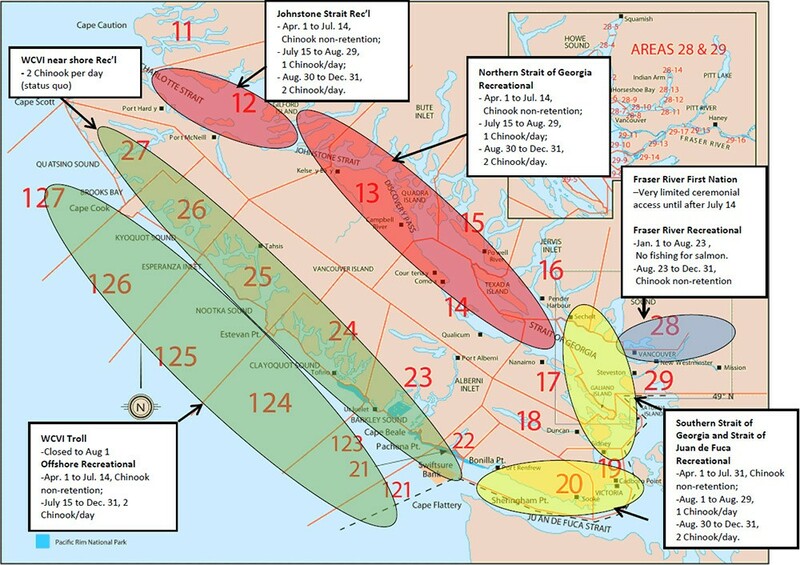 Management Areas and locations of Canadian fisheries that intercept Southern B.C. chinook stocks of concern. Primary fishing area represented is the Northern Troll fishery and Aggregate Abundance Based Management Recreational fishery shown in purple and the Northern Individual Stock Based Management (ISBM) fisheries. ISBM rec fishery shown in yellow. Numbers indicate Pacific Fishery Management Areas.